2016 sees the 8th annual event held at The Ticketpro Dome in Johannesburg, South Africa. The event has grown annually to include new brands & different aspects of photography. This one-of-a-kind annual event is open to both the trade and the public and is aimed at growing the industry by offering a unified space for product comparisons and featuring new technology, while also offering the end user training to improve the skills of the industry in general. This will be my third year when I will be attending this expo and looking forward to buy certain camera stuff which was pending for this year's expo. The Photo & Film Expo not only caters to professional & amateur photographers but to enthusiasts, technology fanatics and their families looking for the ideal gift. The event provides the opportunity to compare, touch and demo hundreds of brands under one roof from high end camera & lighting equipment to accessories like bags, tripods, drones, underwater housings, printers, storage devices and much more. Several locally manufactured photographic products are also showcased at the event. The most educational photographic event in the world! 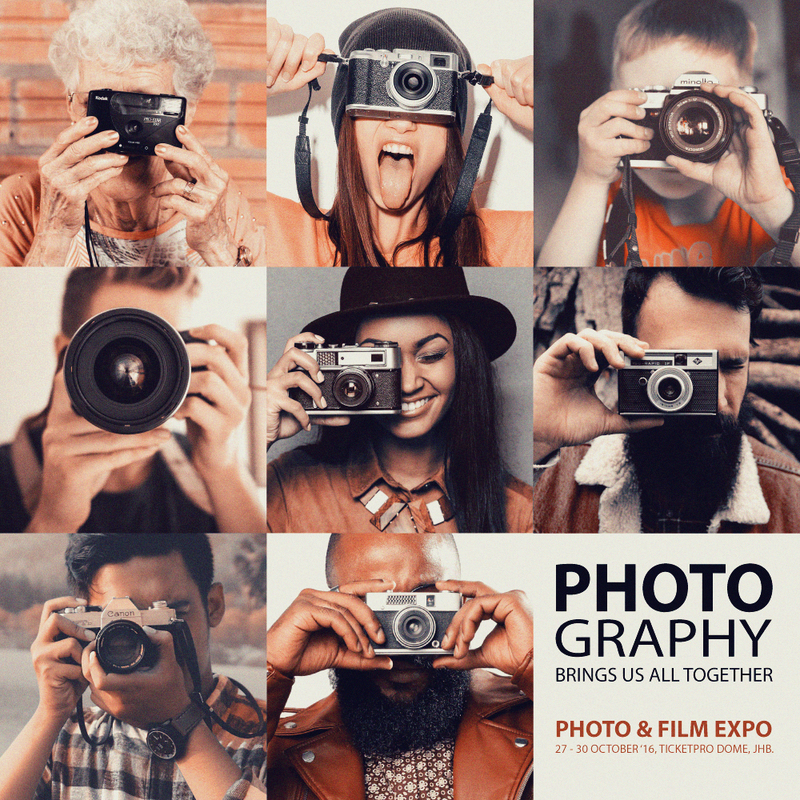 For those all geared up and wanting to take their photography to the next level, The Photo & Film Expo offers over 120 FREE workshops (no repeats) to inspire and live demonstrations to blow them away. 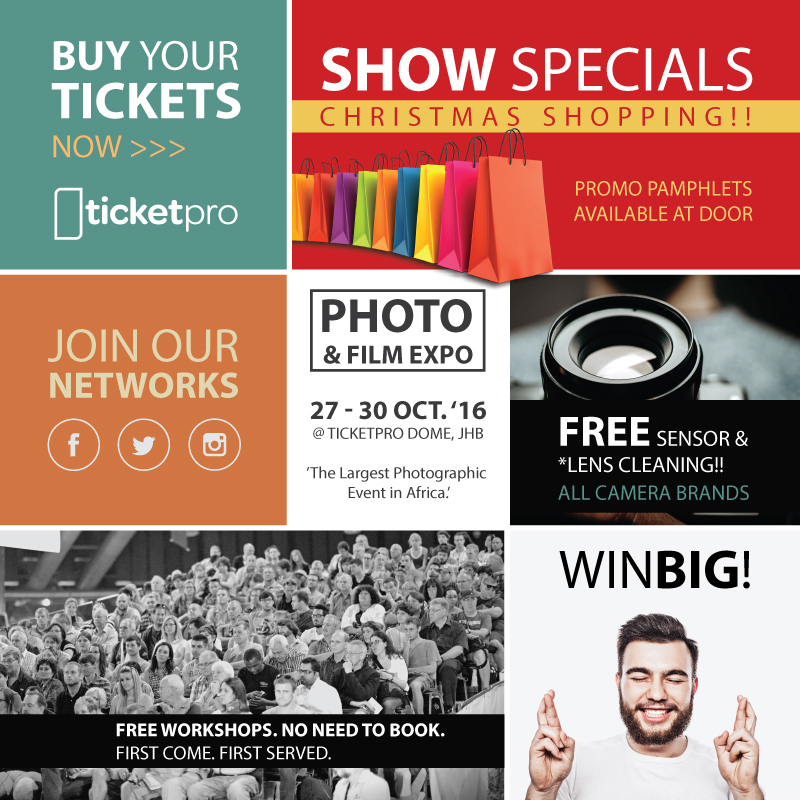 (Workshop Schedules are available on http://www.photofilmexpo.com). Some exhibitors include colleges & varsities as well as clubs for those looking to pursue a career in photography or filmmaking. Visitors take along their cameras, as there is always an abundance of photo opportunities with an underwater area, a beauty corner, drones, body-painted models and plenty more for their entertainment. Visitors can also get their camera sensors and lens outer elements cleaned for FREE at the Future Specialist stand or charge their cameras and mobile devices at the Rapidstudio Lounge while enjoying a FREE massage between workshop sessions. Apart from rushing to see all the new product releases visitors tend to also save up for this event to take advantage of the expo deals. The specials are too tempting to resist & with all the new innovative products they are sure to find what they have been looking for. Professional advice, guidance & the ability to compare will ensure they make the right decision when investing in gear and the deals of up to 75% off make the purchase that much sweeter. Attendees who are flat broke, & shopping is not an option, don’t have to stress. Competitions run from almost all the stands & by just attending the show they can enter into the PHOTO & FILM EXPO lucky draw! Over a Million Rand worth of giveaways, special package deals and prizes are given away each year at the event. The opportunity is there to network and learn, it’s the ultimate ‘One Stop Shop’ for everything photography related. Every year the event incorporates new exciting feature areas. This year brings the return of the overwhelmingly popular bodypaint and beauty area where people can watch the process and photograph the end products in the established studio areas provided for visitors. Top bodypainters compete against each other in this area with an awards ceremony on Friday afternoon. The upgraded underwater area features a large unique tanker built from a shipping container with windows built in so that visitors can watch the live underwater photoshoots taking place inside, expect to see mermaids and much more. Borehole water is utilized for the area and will be recycled after. A dedicated meeting lounge provides visitors with an area to meet with fellow industry members or trade, the area also provides charging stations to top up their phone and camera batteries, and they can even take advantage of a massage session to ease their muscles between long training sessions. Then take a trip down memory lane at the Alternative Print Workshop area where you can see the use of specialist chemicals and developing processes used to create images on site from taking a photo the old fashioned way right through to developing the image on site using modernized instant developing chemicals. The SHE.CLIX gallery organized by Olefa Yalo features works of top female photographic artists, works will be available for purchase. UNEQUAL SCENES – US born Johnny Miller is offering a new perspective on the sharp divide between rich and poor in South Africa with a series of aerial photographs. Johnny Miller's project, Unequal Scenes, saw him use a drone to capture images of some of the countries richest and poorest neighbourhoods. EVERYDAY EDUCATION gallery is works by a trio, from the United States, South Africa, and Tanzania who visited 20 schools documenting learners, teachers, and leaders. Rebecca Crook, Zach Louw, and Sam Satchu aim to use visual storytelling to highlight the stories of innovative and resilient education, and to influence others to celebrate and share stories of educators in their own lives. Everything photographic for every kind of Photographer.